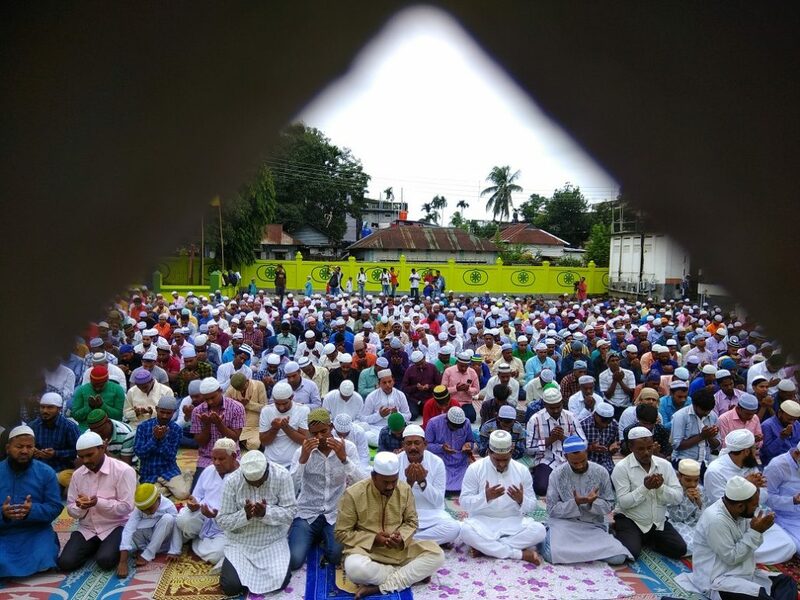 Thousands of Muslims from all across Tripura gathered at the Gedu Mia Masjid in capital Agartala to offer morning prayers on Eid-ul-Azha. The Eid prayers started around 8:30 am and conducted by Imam of the mosque Maulana Abdul Rehaman. After the namaaz, devout Muslims hugged each other and exchanged greetings of peace and love even with those belonging to other religions and faith. It is the festival of sacrifice celebrated by Muslims worldwide to commemorate the willingness of Prophet Ibrahim to sacrifice his son to keep his word to God. “Islam gives the message of sacrifice and this celebration of Eid is basically for the sacrifice of all that are bad in us. It spreads the message of love,” said Syed Sajjad Ali, a local resident. According to him the Islamic philosophy and religion preach sacrifice or ‘kurbani’ on this day by commemorating the sacrifice given by Prophet Mohammed and also following that practice. Md Insaramat Mani, a resident of Jammu and Kashmir, was happy to celebrate Eid in far-off Tripura, which he described as a ‘very peaceful place’. His native Kashmir is torn asunder by violent anti-government protests that have forced authorities to allow prayers only in mosques. Similar was the expression of Md Sherafat of Uttar Pradesh who along with his colleagues is celebrating Eid far from his family and home state. He also said that though this is little painful to be away from family during Eid, here in Tripura it is very peaceful as people from all the communities and religions celebrate and live in peace. Muslims across the world celebrate this festival with great enthusiasm and respect. Each Muslim family which is capable of sacrificing any animal prescribed in the Holy Koran does so and distributes the meat to the poor and also gives donations to various institutions, especially those that run orphanages and elderly homes.